With custom wood lockers, you can design a locker room that is not only functional, but also attractive. Choosing a high-end build quality and finish for your wood lockers can elevate your locker room to a new level, making it more appealing to prospective customers. Now, with Legacy Lockers’ Club Series lockers, you can have the ultimate blend of styling and affordability for your custom wood lockers. For a complete look, you’ll want to choose the perfect wood locker and custom wood furniture combination. Fortunately, the Club Series makes this easy and affordable. 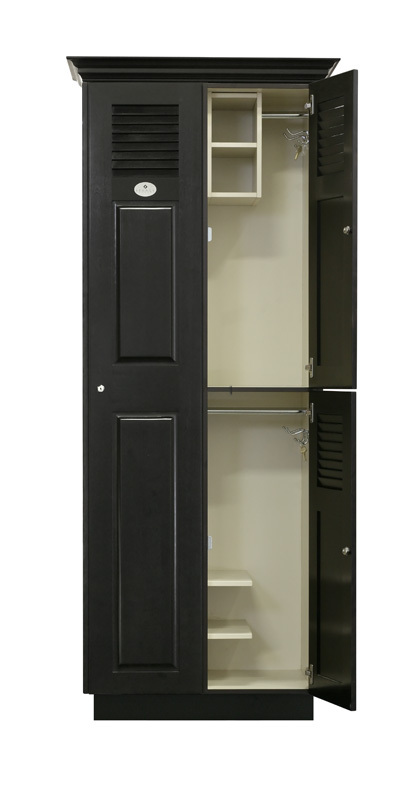 Featuring a true solid wood, raised-panel louvered wood door, with exquisite furniture grade finishing, Club Series custom wood lockers are made with long-lasting hardware and rock-solid construction. The standardized 80″Hx15″Wx20″D format helps ensure that your order will be fulfilled quickly as well as easily installed, and available in both single and double tier configurations. To further advance the aesthetic appeal of your locker room space, Club Series custom wood lockers are available in a wide range of stain colors and finishes, in order to perfectly suit your vision for interior design. There are also many options for interior accessories, to allow you freedom of customization. Club Series allows you the premium appearance of custom wood lockers, meeting your quality requirements while also fitting into your schedule and budget. No matter what your vision may be for your locker room, Legacy Lockers can help you realize it. With more than 65 years of manufacturing experience in the woodworking industry, Legacy Lockers provides superior workmanship and excellent customer service. In addition, the knowledge and expertise Legacy Lockers brings to your project allows for the designing, building and delivering of exceptional, dependable products that will stand up to many years of use. For more information about how Legacy Lockers can help you design the perfect locker room for your space, visit the website, or call 866-937-1088.